Within the last couple of weeks I have been busy implementing a first Watson AI powered product implementation at a customer site using a Domino/Xpages based frontend. The Watson part of this application will be something to talk about later on but I wanted to take the chance to blog about a couple of frontend components and plugins for the Xpages part, that I found truly handy along the way. This will be a series of blog posts in the next couple of weeks but each post will be independent from each other. Some basics – all I am talking about is using Bootstrap and jQuery as the base for the frontend component. I also use a bootstrap theme for the application so I will not cover overly much of the CSS parts of the application besides the CSS parts of the specific plugin. 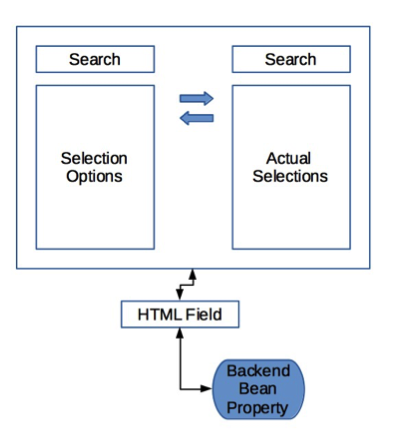 Also, the application de-couples frontend and backend data by using beans in the Xpages world and to use JSON micro services to get to the requested data in the backend. Let’s start out with a common problem in a form – multi selection fields with a nice bootstrap interface, especially if you have to select from a large amount of options. I was looking for a plugin that allows search, multi selection and is so easy that it binds to a single HTML field. Note that we load this as a head tag to work around AMD loading issues with good’ole DOJO. The key value connection is the style information “dual_select”. The “form-control” style defines an input field inside the Bootstrap theme. Why did I do this ? Well, the Xpages Listbox is a real beast when it comes to return values. If you do not select anything, it will return a null value as expected. If you select one item, it will return a String, if you select multiple options, it will return an array. So we have to normalize this for our bean to pick up the data correctly. There might be a better way to do this and probably someone came up with a more sophisticated solution. Anywho – it works for now. So overall no big deal to get this up and running – the bean delivers an array of select items. Have fun with this one – I really like the filter options and the in and out switches to quickly find and select items from a potentially long list.